WashAndGo is a virtual scrubbing brush for your PC. Keep your hard drives spick-and-span with WashAndGo. Our award-winning application provides an easy means of cleaning your whole system. WashAndGo removes garbage files within seconds and helps you to keep a clean and fast Windows system. Optimizing your PC couln’t be easier. The program is fast, secure, and reliable. – Let WashAndGo reclaim your wasted disk space! WashAndGo removes garbage files that fill up the hard disk and do nothing except slow down the PC. Garbage files that can be removed by WashAndGo include temporary files not removed when programmes are closed, old file safety copies which are created automatically by some programmes, 0 byte files with no real content, wrong and confusing Windows Registry entries, duplicate DLL libraries, superfluous and outdated service pack files, wrong Uninstall entries and Internet Explorer, Opera and Firefox browser caches. Together, these unnecessary files can cause a computer to run slower than usual, and take up disk space. WashAndGo tells its users how much disk space has been freed, so the benefits of running the programme can be seen immediately. A single mouse click starts WashAndGo examining the hard disk. 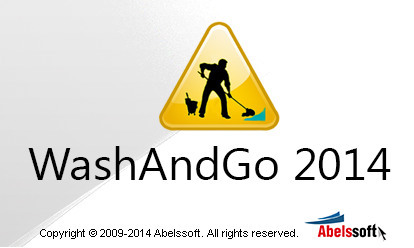 Users then review a list of detected garbage files and authorise WashAndGo to remove them. Users who prefer to be on the safe side can switch on the security option of WashAndGo to enable the recovery, if required, of all removed files for up to 14 days after the clean up. In case of any problems, WashAndGo creates a security backup. This allows you to undo all changes at any time for a period of 14 days. WashAndGo will only suggest to remove a file if it can be almost 100% sure that this entry is unnecessary and may be removed. WashAndGo can download security updates automatically if you want. This allows you to keep WashAndGo updated all the time.